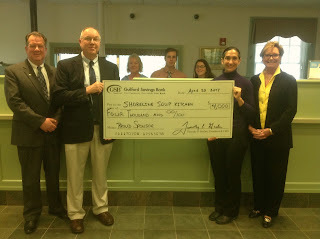 The Middletown Insider: Guilford Savings Bank Supports Shoreline Soup Kitchens & Pantries with "Green for Greens"
Guilford Savings Bank Supports Shoreline Soup Kitchens & Pantries with "Green for Greens"
Saving Bank Community Development Officer, Lisa La Monte. Guilford Savings Bank has awarded a $4,000 grant to Shoreline Soup Kitchens & Pantries to purchase fresh produce for needy residents of the shoreline. The grant, called “Green for Greens”, helps assure that local families who come to SSKP’s food pantries will be provided with fresh fruit and vegetables, in addition to non-perishable foods. GSB has been serving the financial needs of the Connecticut shoreline for over 140 years. Recently named the #1 Community Bank in Connecticut, it is the premier relationship bank, providing banking, lending, wealth management and life insurance solutions for personal, small business and commercial customers. For more information visit www.gsbyourbank.com.